Bicycle Descending Technique for Mount Diablo! We have been observing how cyclists descend around the 300 curves on the mountain. The majority of cyclists are putting themselves in danger (red path below) without knowing it. We analyzed 30 Bike vs Vehicle Collisions (2010-2017) and reviewed numerous Near-Miss Bike vs. Vehicle Collision videos. In addition, we spoke to collision victims and cycling experts. Please consider practicing this descending technique! Please share it with your cycling friends and cycling groups who plan to ride Mount Diablo! Special Thanks to Linda, Avery and Carl for their help creating this amazing poster! Dial “911” immediately to report a medical emergency. Descend at or below the posted speed limit and stay as far to the right as practicable. Do not wave-on vehicles to pass you. Call out, “On Your Left” when passing other cyclists. Ride single file when vehicles are present. 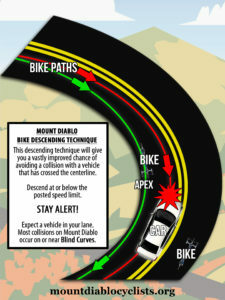 On Blind Curves, ride single file, as far to the right as possible. Anticipate a vehicle coming at you, in your lane, wherever you can’t see! Do not wear earphones in both ears, it is illegal; be aware of your surroundings. Pull over and stop to allow emergency (siren) vehicles to pass you safely.